One of the rarest model, Marlow Explorer 57E, gems has finally arrived on the market! For the family who desires a perfect size yacht that includes the treasured 3 staterooms, 3 heads AND a separate crew quarter with an additional head. In addition to the highly anticipated spacious open flybridge layout, this yacht boasts the larger engine package strategic to Caterpillar. Utilizing the C-18 1015HP twin diesel engines that make her a highly economical and excellent performing vessel under rough sea conditions or just meandering lazily through the beautiful Caribbean waterways. All the while taking advantage of the semi displacement hull, giving you the benefit of cruising fast at 20+ knots as well as trawling at lower speeds with a great economy. The European style transom, with port and starboard transom doors, provides easy access to the large teak swim platform. Twin salon doors open into an expansive salon and can be left open on nice days. The high gloss teak and holly floors in the salon are just the beginning of the quality of fit and finish you will see when aboard all Marlow Explorer yachts. The Marlow Explorer is one of the few yachts in the world whose manufacturer has taken the time to optimize the basic hull design. Most yachts built today are very similar to each other and their predecessors over the last 20 years. When you see a Marlow Explorer on land you notice very quickly that the yacht is blocked at the bow like every other boat, but at the stern she is sitting on her own proprietary twin Velocijet Strutt Keels. The propellers are position with a prop pocket gaining the ability to be well above the bottom of the keels and it is obvious that a light grounding on a sand bar will only result in some worn bottom paint to the keels without ever touching or hurting the props! What is not so obvious is how these strut keels will make the boat handle in a following sea. The lateral resistance provided makes the boat track straight with very little rudder correction required. On deck you can see that the teak planks do not have bung holes hiding screws because they are epoxied in place. You can tell that the deck is molded as one piece because there are no seams from the transom to the bow, including the Portuguese bridge. The windshields and side windows are tinted glass and laminated with a layer of 3M Hurricane shield to a total thickness of 11mm, twice what most builders use in vessels below 100'! The teak rails are perfectly finished with 10 coats of the finest varnish. The hull is molded in gel coat and topped with Awlgrip for a beautiful Flag Blue finish which many builders will not deliver. The bilges are smooth and finished like the rest of the yacht. In the cockpit cabinet under the stairs there is a wired remote third control station. This device will let you operate the shift controls and throttles for both engines and use the bow and stern thrusters. In addition, she has been equipped with the latest easy to use “Yacht Controller” giving you the amazing ability to walk all around the boat deck and even dockside with this remote wireless remote-control device used for docking and maneuvering with a safe and reliable system. When you enter the salon from the aft deck you feel the spaciousness of the vessel's 18'2" beam. The composite construction has allowed this space to be very open, allowing you to see beyond the salon and galley to the front windows. The tinted windows and wooden blinds allow just the right amount of light into the space. On nice days when you want natural ventilation the second aft door can be unlatched and slid open to create a 5' wide opening. The large settee is upholstered in Ultraleather and is beautifully tufted. Under the salon seats there is a string of 110V lighting that provides perfect accent lighting. The deck light circuits and 110V plugs are on the 4,000-Watt inverter so you do not need shore power or the generator to have these on. On the forward end of the salon there is a 37" Sharp HD flat-screen TV. There are 5 overhead halogen lights in addition to the 24V Italian, Cabin Denmark lighting and valance lighting. There is a beautiful large teak table in front of the settee. The table also has two magazine racks on the ends and has drawers for storage. In the forward passageway as you leave the salon is a storage cabinet with two slide out storage shelves that have inserts to securely hold glasses and bottles. The overhead teak valance on the starboard side has slots that diffuse the air-conditioning, so you do not have air blowing directly on you. This overhead valance also houses the 5 small speakers for the Bose home theater system. The pilothouse is up three steps from the salon and includes the lower helm station, dinette and galley. There are port and starboard exterior doors, a staircase forward descends to the staterooms and a staircase on the port side aft ascends to the Flybridge. The galley is very well equipped with top of the line appliances and plenty of storage for provisions and housewares. The galley is designed utilizing the U-shape with beautiful black galaxy granite counter tops. If you are moving up to this size vessel from a smaller boat with a lower helm at the same level as the salon, you may think you will not use the lower helm much. But the beauty of the raised pilothouse design and the lower helm moves up and forward enough that dodging crab pots from this helm station is no problem. Because of the open layout, you have visibility straight through the salon to the aft deck. With practice you will not only run the boat from this station you will find you can dock just fine from this position as well. Most owners find they use both helm stations every day depending on conditions. The lower helm is complete with Stidd helm chair for the captain next to a gorgeous teak dinette with Ultraleather seating for guests. In front of the helm chair, you have all the systems a captain would need. The engine displays, 12" Furuno NavNet screens, Autopilot, VHF, and other critical systems are all within easy reach. The overhead panel has electronic circuit breakers, an Inverter control panel, tank tender fluid level monitor for all tanks, bilge pump controls, and the vessel safety indicator lights. On long passages you will appreciate the ability to take 3 steps back to the galley while still being able to see out the windows and easily monitor the Furuno screens. The master stateroom is amidships full width, making it very light and roomy with teak and holly sole throughout. “Marea” has an island king berth with large drawers under the berth. The walls and cabinetry are all satin finished Birds Eye Maple with teak accents. There are two cedar lined hanging lockers and several lockers with shelving. The LCD TV is easily viewed from the bed. There is a beautiful nightstand on each side of the bed with 3 large dovetailed drawers mounted on ball bearing slides. A swing arm lamp is mounted just outside the headboard on each side to provide perfect light for reading. A beautiful curved solid teak valance over the headboard of the bed has small halogen lights on a dimmer. The slots in the top of the valance diffuse the air-conditioning and send it out into the middle of the room, keeping cool drafts off the bed. There are 5 opening port lights with screens. When you want privacy in the marina, the Shoji screens provide privacy while still providing light. The ensuite head is very spacious with vanity marble counters, an under-mounted china sink bowl, Grohe faucet, several drawers and cabinets with shelves for storage of toiletries. The shower area has a large teak-framed Lexan door and the shower sides are finished in high gloss gel coat trimmed in teak. There is a nice cabinet in the shower area to store toiletries. The tank tender is next to the head allowing you to see the state of the holding tank at a glance. The VIP stateroom forward has a center-line island queen berth with six large drawers under the berth. All the cabinetry is satin maple with teak accents. There are twin bunks over the queen bed that are perfect for guests to be able to stay in the stateroom with complete family of four. There are twin cedar lined hanging lockers. There is 15" flat screen TV that is mounted on the aft wall of the stateroom. This stateroom has a CD stereo and berth reading lights. Two screened overhead hatches provide light and fresh air. There is a full head with separate stall shower accessible from the stateroom or the companionway to allow use as a day head. The Lexan shower door is a beautiful curved shape framed in solid teak to make the best use of the space. Both the head and the shower have exhaust fans vented outside the vessel. The sink is an under-mounted china bowl on a marble top finished with teak fiddles. The second guest stateroom is on the port side of the vessel at the base of the stairs from the Pilothouse. This stateroom provides two comfortable bunks and a cedar-lined hanging locker. There is a 15" flat screen TV on the aft bulkhead viewable from the berths and a CD radio. Double doors open this area to the companionway where you descend from the pilothouse giving the yacht a very open feel. This bunk room also has its own head with separate shower stall, providing a true 3 stateroom 3 head yacht. Most professional captains tell us that we have the best engine room they have ever been in on a vessel of this size. You can get to everything quickly and safely with 6'2" “standing tall” head room. The area is well lit with 110V and 24V lighting. There are 4 large blowers to cool the space down after a run and the area is air-conditioned, so maintenance can be done in comfort. There is a large mirror on each side of the engine room, angled perfectly, so you can inspect the outboard side of the engine without going outboard. Each diesel engine has dual Racor filters. The fuel system is very simple with 1 large 1320 gallon tank that you can fill from either side of the boat. The engine beds are very heavy polished stainless steel and secure the engine vibration isolation mounts to the hull stringers and run all the way past the transmissions to accept the thrust load of the Aqua drive units. The dripless shaft seals have a crossover tube that supplies water from both engines, so you can safely run on one engine. At the aft corner of the engine room you will find twin Sea Chests with removable clear cleaning port. Each of the engines, generator, air-conditioning system, salt water washdown and all the other components of the yacht that require salt water have their own shut-off valve on the Sea Chest. One hull opening for each Sea Chest for all sea water needs provides great safety. The 1,015 HP Caterpillar engines are connected to the underwater exhaust system via elevated temperature silicone hose to further isolate noise and vibration. • Aqua-drive shaft coupling and soft engine mounts for a smooth quiet ride. 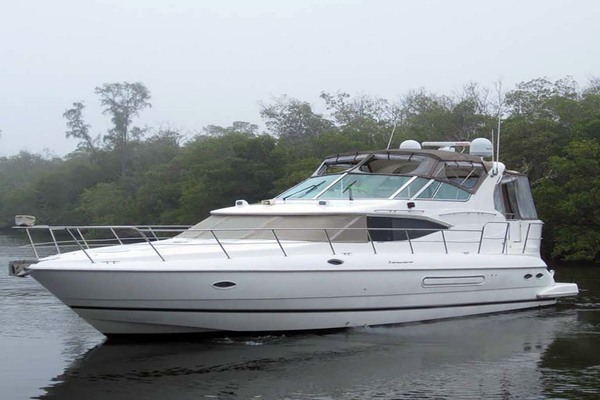 The flybridge is an excellent place for fair weather cruising and entertaining guests. The twin Stidd helm chairs are very comfortable. The Furuno NavNet 3D package is complete with dual 12" screens, 12kw radar, sounder module and camera system. The Caterpillar electronic display is immediately forward of the large stainless-steel wheel. The console also has displays for wind velocity and direction, water depth, and boat speed. The VHF and the yachts intercom phone are within easy reach. The flybridge is protected by a full factory fiberglass hardtop. The flybridge is accessible by stairs from inside the pilothouse and from outside from the cockpit. There is comfortable seating aft of the helm chairs and a large table perfect for dining outside. There is a sink, refrigerator with ice maker and plenty of storage as well as a full-size Fire Magic gas grill. • The 1,000-pound hydraulic davit with remote and the dinghy with outboard are aft of the flybridge seating area. Even if you are not sure you want crew you will find the spacious crew cabin provides great storage and on those family gatherings no one will feel slighted staying in this space. You may find with the vast range of the Marlow Explorer you will want to venture offshore for days at a time and taking on some help is a very nice option. The Crew Cabin has its own entrance, no need to come into the salon to get to the quarters. There is a nice bunk, head and shower, TV, ample storage, and a refrigerator and microwave. The full size stacked washer and dryer is in the main hallway between the staterooms so everyone staying on board has access. There is a storage locker for detergent and other supplies a few feet away at the base of the stairs. • Gray Water: 90 Gallons, set up for automatic overboard discharge or holding. The dinghy is easy to launch with the full hydraulic davit. You will appreciate the soft sides of the RIB dinghy as you approach the beautiful blue Awlgrip hull on a choppy day. “Marea” is a rare opportunity to own a perfect size Marlow Explorer without waiting for one to be built. “Marea” has been built with all of the most popular options including 1,015 HP Caterpillar engines, a bow thruster, stern thruster, factory hard top, Stidd helm chairs, and chilled water air-conditioning. Her engines will give you a 23-knot cruise and her 1,320 gallons of fuel will let you cruise at 8 knots for 1,200 miles. The 18' 2" beam makes her 57' feel more like a vessel in the 65' range. The master stateroom is amidships and is the full width of the hull with a private head. The full stand up engine room with air-conditioning will be a pleasure to work in.